Criminal and Family Law Attorney, Erika Garrott Johnson, Esq. Erika Garrott Johnson was born and raised in Hagerstown, Maryland. She graduated from St. James High School in 2001, and went on to graduate from Towson University with a B.S. in Law and American Civilization in 2005. While at Towson, she worked for a criminal defense firm and found her passion for criminal law. Erika went on to attend University of Baltimore School of Law. She worked for the Baltimore City State’s Attorney’s Office as a law clerk, and was a Rule 16 Student Attorney for the Baltimore City Public Defender’s Office where she represented her first clients. Upon graduating in 2008, Erika returned to Hagerstown and served as a law clerk for the judges of the Washington County Circuit Court for two years. Erika gained valuable real world experience working with the judges, and developed a deep understanding of the judicial process. This most valuable experience aids Erika in effectively assisting her clients today. Erika is a member of the Maryland State Bar and Washington County Bar Association. She is also a certified mediator. 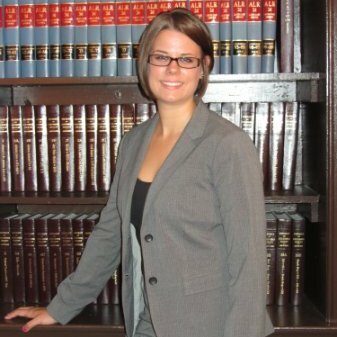 She focuses primarily on criminal defense and family law. She enjoys spending time with her husband and two stepchildren. On the weekends you will find her riding her horse, Mae, or on the back of her husband’s Harley. She serves as the Financial Director on the Board of Directors for the Smithsburg Community Volunteer Fire Company.